When you first arrive to the front doors of our parish, you are greeted by a beautiful life-sized bronze statue by world-renowned artist and sculptor, Timothy Schmalz. The piece is entitled, Whatsoever You Do, and is based on the Gospel of Matthew, Chapter 25; we simply call it, The Beggar Christ! 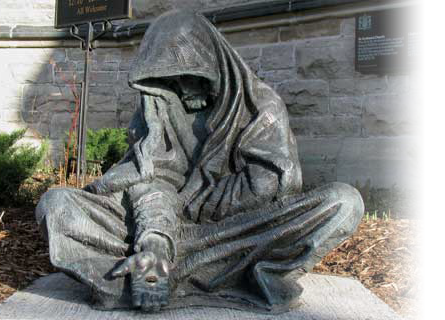 The sculpture suggest that Christ is one with the most marginalized in our society. It is a strong, visual representation of what our parish represents: an inclusive home, a strong welcome, with deep and abiding hospitality for everyone, without any reservations. We welcome everyone! Welcome to a parish that welcomes everyone! Welcome to a place of hope, loved and hospitality! Download a Brochure from the artist by clicking below and see the original sculpture located at Santo Spirito Hospital in Rome, Italy. Download a Brochure from our Parish on this sculpture, its dedication, and meaning by clicking below.